Hey Everyone!! The weekend is already over but I'm not worried. Time seems to be flying by anyways, so this weekend will be here any minute in Fallon time. ;) I had a fabulous Italian dinner Saturday night at a friend's house party! My childhood friend just graduated and became a firefighter just like his dad. We are like family to them, so it was nice to celebrate this accomplishment. The food was REALLY good. Sorry no pictures (camera battery was charging), but I'll type what they had. Can't remember the name but it was a mixture of peppers marinated and topped on homemade ciabatta bread.. THE BREAD WAS AMAZING! His grandma made it and brought over like 8 huge loafs! Beef Braciole, this was amazing. My first time trying it and now I'm ready to make my own. Spaghetti and meatballs. They used whole wheat pasta too! Delicious Italian salad with a Tarragon dressing. Here is a recipe similar to what she described to me but she also had added some Dijon mustard and a little sugar. A firefighter truck cake, she made it with a pan and decorated it. It was really cute! Vanilla Cheesecake with Cherries... The crust was the best part of this bad boy. I picked that off and gave the rest to mom! Oh and I had a glass of Santa Margharita Pinot Grigio.. That is about the only white wine I actually enjoy! Other then that I'll stick with red! Okay enough of my yummy Saturday evening and onto sometime that I love. Fruit is amazing and it is something I can never have enough of! 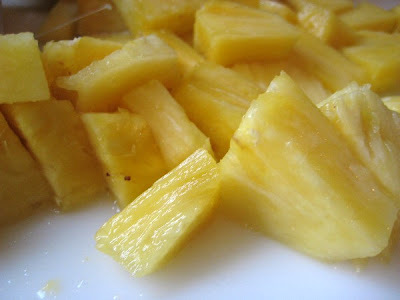 Lately I've been buying some of the sweetest and most delicious pineapples! 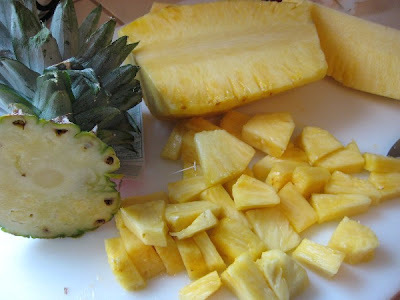 I don't know about you, but not only is being in the kitchen relaxing but cutting fruit is something I enjoy even more! 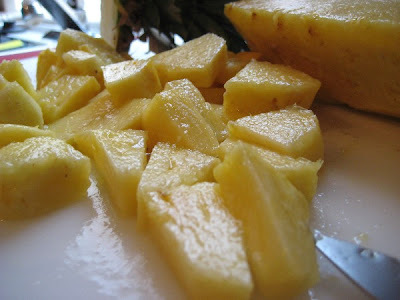 I love cutting pineapples, watermelons, cantaloupe, honeydew etc. Just something about it relaxes me. Weird huh? LOL I figured this be a perfect moment to give love to the pineapple. When I pick a pineapple I don't go for color. First I start pulling the green leaves off. If they come off quickly, then that the first step of it being a good pineapple. Then next I'll smell the bottom of the pineapple. If it smells sweet and doesn't look over ripe, then I know its a winner. Sometimes they can be really green but when you cut into it the flesh is super right and it just smells sweet. I've always picked my pineapples like that. How do you pick your pineapple? After all that cutting and coring, I was ready for a snack. I cleaned some strawberries earlier as well. In a bowl I added 2 oz. of organic raspberry yogurt (any flavor will do) and 2 oz. of plain Greek yogurt. Mixed them till they were incorporated. I like to do this sometimes because regular yogurt has a lot of sugar and can be very sweet, so the plain Greek mixed in helps to balance the sweetness. It is perfect. Next I topped with some pineapple and strawberries. 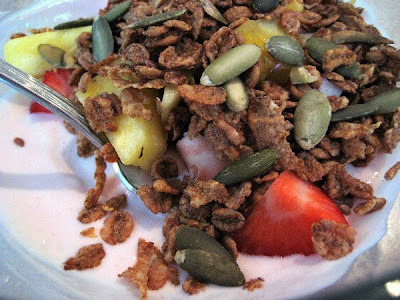 I topped with a 1/4 cup of wheat cereal for crunch ( granola or cereal of your choice) and 1 tbsp of raw pumpkin seeds or pepitas! This has been one of my new snacks lately and it is just so good! I love the combo of yogurt because there is a little protein from the Greek yogurt and a slight sweetness from the regular yogurt. 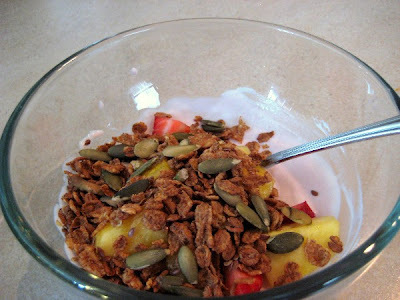 The sweet fruit and the crunch of the cereal and pumpkin seeds makes for a delicious and healthy snack! Before I go I also wanted to announce that I'm running my FIRST 5k in 2 weeks. It on February 6th and it is for Run For A Wish. I'm really excited about this, and I can't wait to blog about it when I past that finish line. I decided to do the untimed version because I don't know what to expect and I haven't been training enough. I just started today with making sure I get my adequate runs in for the week but still won't be enough time in 2 weeks. It only a 5k, so I shouldn't have any problems anyways! I'm really excited. Mmmm...and it's 4 pm snack time here! Good coincidence. BTW, I left you a reply to your comment--I'd try whipped cream cheese instead of mayo. I like the idea of whipped cream cheese, thanks! Teh food spread looks divine! It's wonderful to share accomplishments with family and friends. Sounds like you had a delicious feast. Your snack is calling my name - sweet, creamy and crunchy...mmmm!